The other day, I took all my potting things off this potting bench. I’ve had it for years and brought it with me from Texas. The wood had faded in the sunlight. So I painted it white and brought it indoors. I’ll let you know what it is going to be used for soon. Last night we had a pretty hard freeze. This photo I took a day or so ago is probably the last of the flowers until springtime. I looked out the window this morning and saw that the six foot tall cannas, standing so thick everywhere I transplanted them, look beaten and brown. It is sad to look at them. It seems that winter has arrived. I’ll need to do some clean up and maintenance out in the yard and gardens to ready things for the next season. I will now be focusing my attention on the indoor plants. I’m glad when the gardening season is over that I can then turn my attention to my house plants for a bit of nature to get me through the winter months. But at some point when it’s warmer outside I’ll have to go out and cut back the drooping cannas on the side of the house by the driveway. As they are now, I’ll brush past them with my car as I pull into the driveway. I love cobalt blue. I often choose this shade of blue because it is so vibrant and pretty. 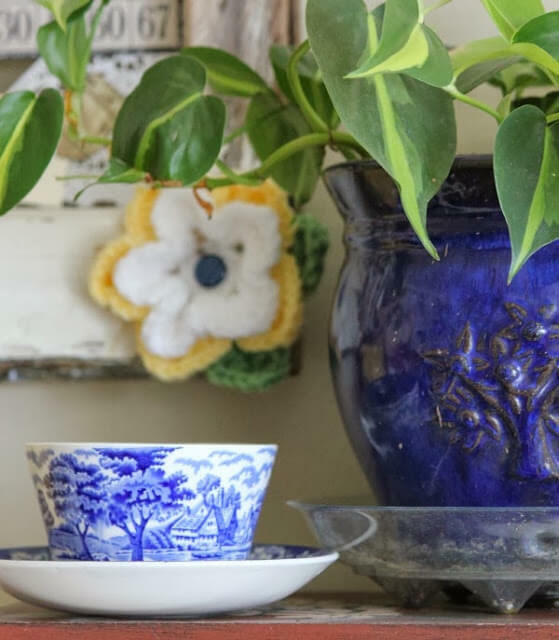 I also love the combination of blue and white, as seen above in the teacup and saucer. I captured a photo of the beautiful male cardinal the other day. He is so pretty in his coat of red. The female cardinal is never far behind. When I see the male arrive I know she will show up soon. I’m off to the kitchen to have my coffee now. I need to warm my hands around my coffee mug and figure out what I need to get done today. Stay warm! Brenda your potting bench looks great painted white. I am sad to see all the outdoor plants die but I have a my few indoor plants are still giving me some greenery in my home! It does seem that it has and I'm glad for it but I also know the feelings of goodwill won't linger past February! I did a Google search for "cozy home blogs" and yours was one of the first on the list. So glad I came across you! I love your photos, style and sharing. Can't wait to learn more. winter is here too. it was 23 degrees this morning. 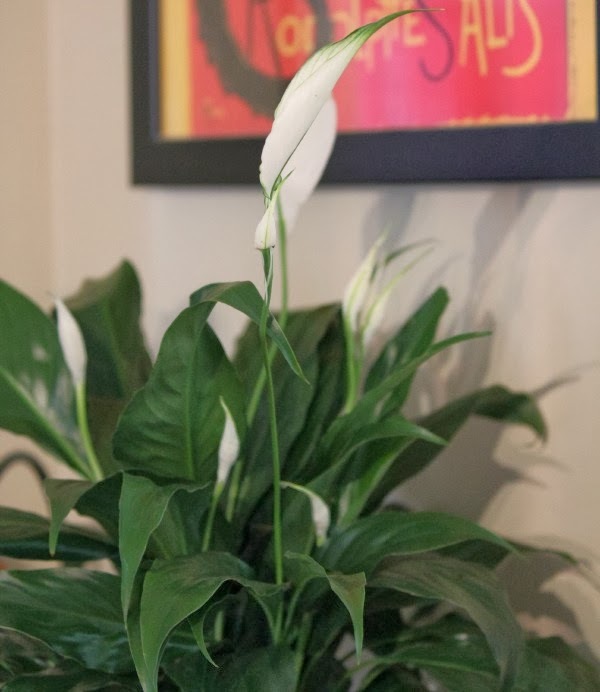 your potting bench looks great in white and your peace plant is beautiful. I've never had any luck with those. Wow, Brenda, that photo of the male cardinal in the Rose of Sharon is about the best I've seen of one of those little fellers. Look how his tail is parallel with the branch, and the spikes on his head are the same as the spikes on the dried blossom in front of him. You can see the tension in his body as if he's ready to take off, and his face has an expression that seems to show the gears whirring in his little head as he ponders his next move. Thanks for sharing it. We've moved to a town that's a bit farther north than our former home, and we've had a touch of snow this week. We haven't seen many cardinals, but we took a drive on Monday, and in a 70-mile round trip we saw over 100 deer! Your blog was recommended by bloglovin' and while I don't usually click over I am so glad I did…love your potting bench. I will be waiting to see what in store for it! Winter has come to Ontario where I live as well, even some snow flurries in the last few days…my cannas are looking brown and wilted as well – guess I better dig up the bulbs and put them away for next year! It's really cold here in Alabama too Brenda, I covered all my plants last night hoping they will survive for a while longer. Stay warm and can't wait to see what you do with the potting bench. It is sad to see the summer plants completely spent…but amazingly, I still have a few begonias hanging on. They won't last long, as we just had our first freeze here in NJ. 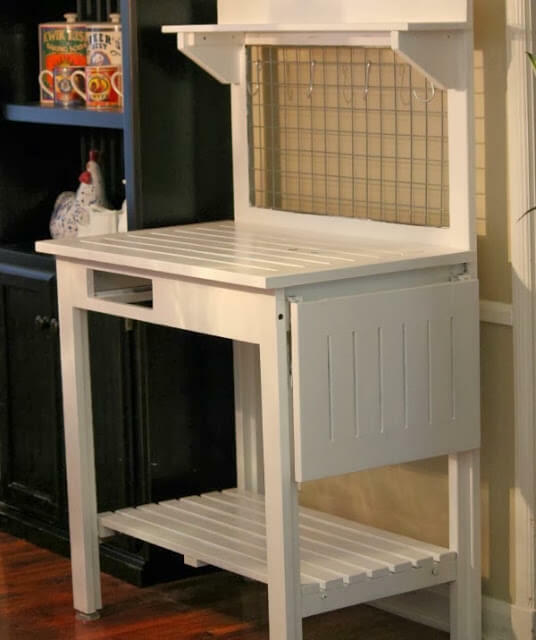 Love your cardinal shot…and can't wait to see what you'll use the potting bench for. I love that photo of the cardinal! 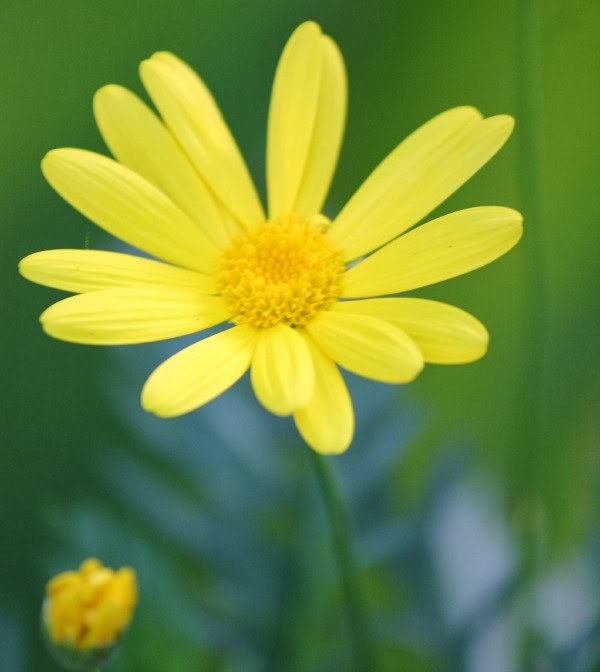 There's no flowers to be found around here…it definitely feels like winter is right around the corner. It feels like winter has arrived here too, at least for the last two days. 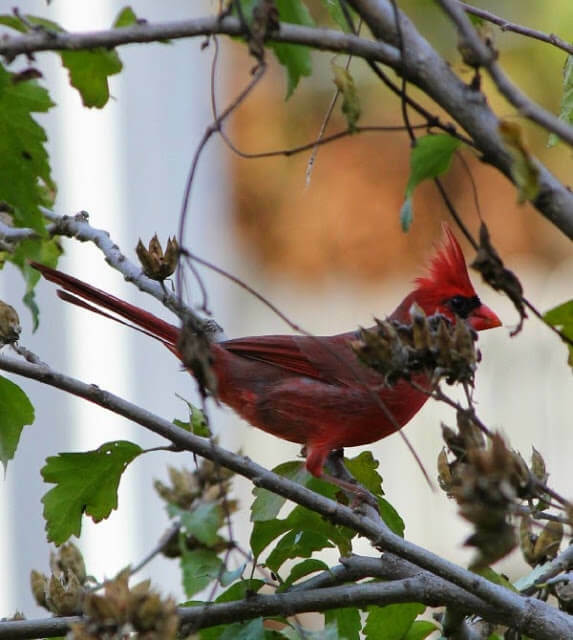 Love the photo of the cardinal…Stunning! Feels like winter here too Brenda…your photos are beautiful!! Beautiful white potting bench, can we say it's a shade of 'winter white', crisp and fresh? Stay cozy, my creative friend! I cut the last of my roses and put them on the kitchen windowsill day before yesterday. It was 23 this morning when I woke up really early, a bit before six. Now everything looks all "toasted" — I don't like Winter. Your bench looks great. It would be a great little baking center! Brenda, what a great example of shopping your entire home AND garden to re-use and re-purpose! Can't wait to see what you will do w/ the potting bench and I am wondering what wonderful red items will adorn it!! The flowers are long gone here in northern IL. We are having such weird weather…it has been really cold these past few days (down to 10 – 20 at night; 30's during the day), but now we're having a gradual warm-up with temps supposedly reaching 61 by Sunday! Your potting bench looks great in your kitchen; can't wait to see what you do with it. Your potting bench looks great! My imagination is curious as to what it will be next! Our flowers here in southwest Missouri also got bit by the frost but I have many pansies that will bloom through till January. I love your blog and have become a follower so I will definitely stay tuned to see how the potting bench turns out! 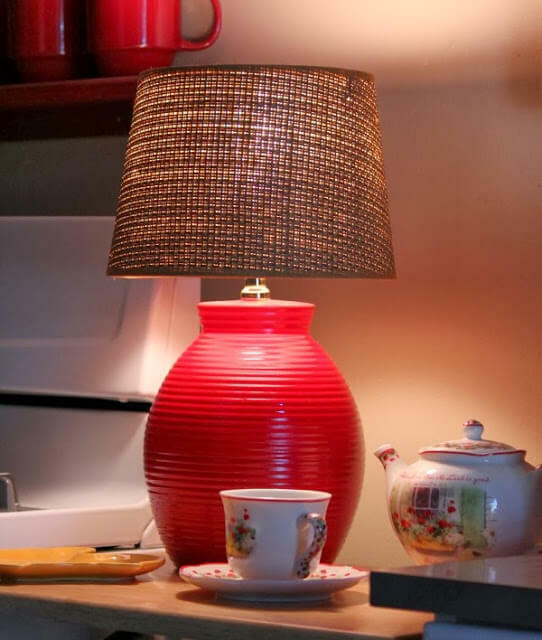 I like your teapot and tea cup/saucer by the red lamp. Where did you purchase it? All your photos are beautiful! Have a great day!